Altay®. Life size. 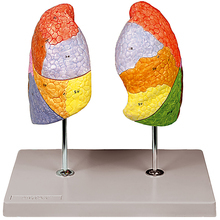 Clearly shows the segmental anatomy of the left and the right lungs. The various lobes are painted with different colors to highlight their locations. On stand with base. Includes numbered key. Size, 33 x 23 x 31 cm.